Cusco is a stunning wonderfully preserved city full of cobblestone streets, steep hills and narrow streets with a European charm to it. 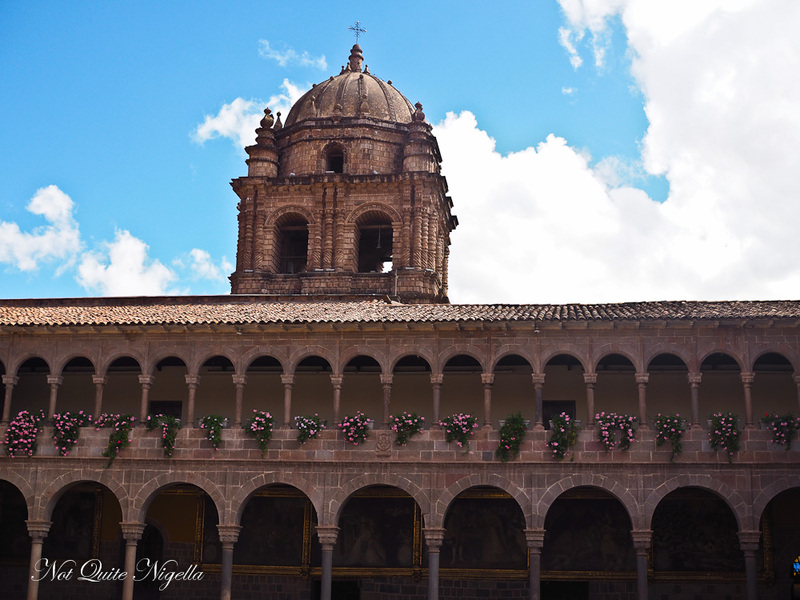 Cusco is part mystic Andean and part colonial. 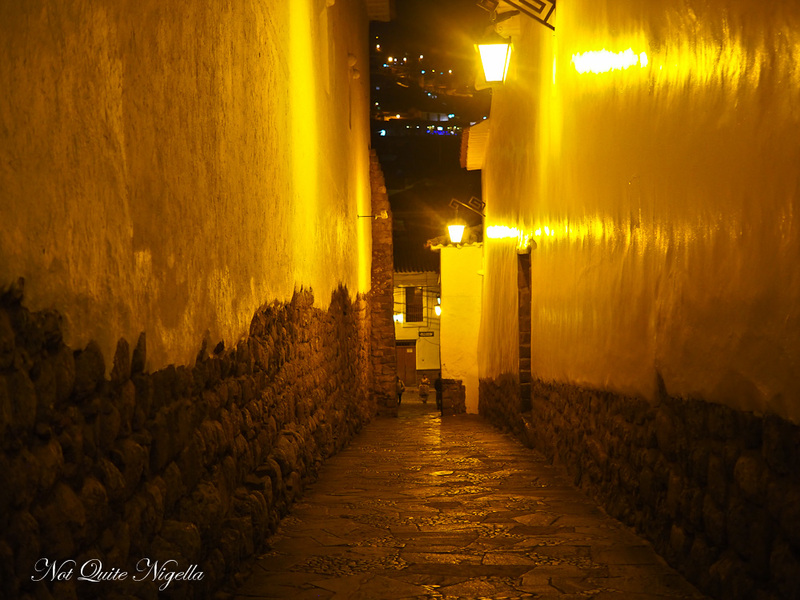 And there's nowhere else in the world quite as magical as Cusco. "Did an Alpaca just walk past?" 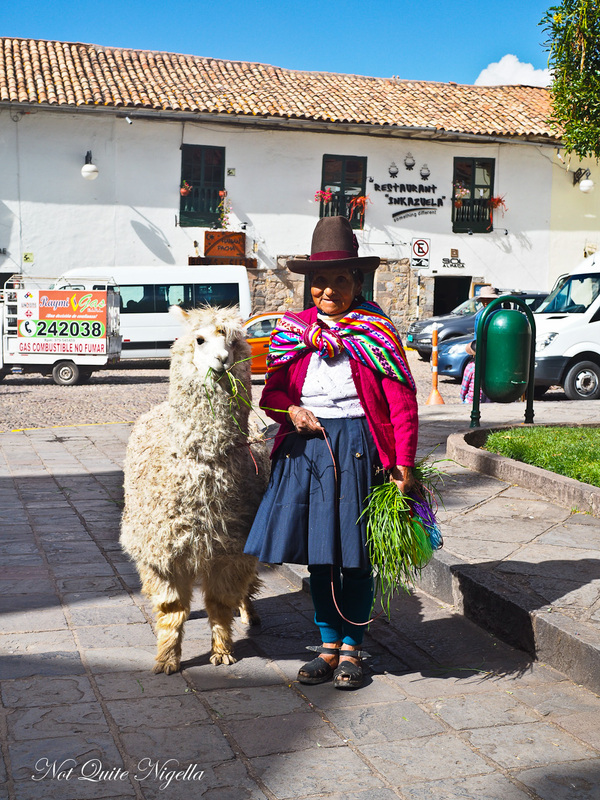 I ask as I glanced up from the hotel lobby to see a colourfully attired Quechuan woman walk past leading her alpaca. 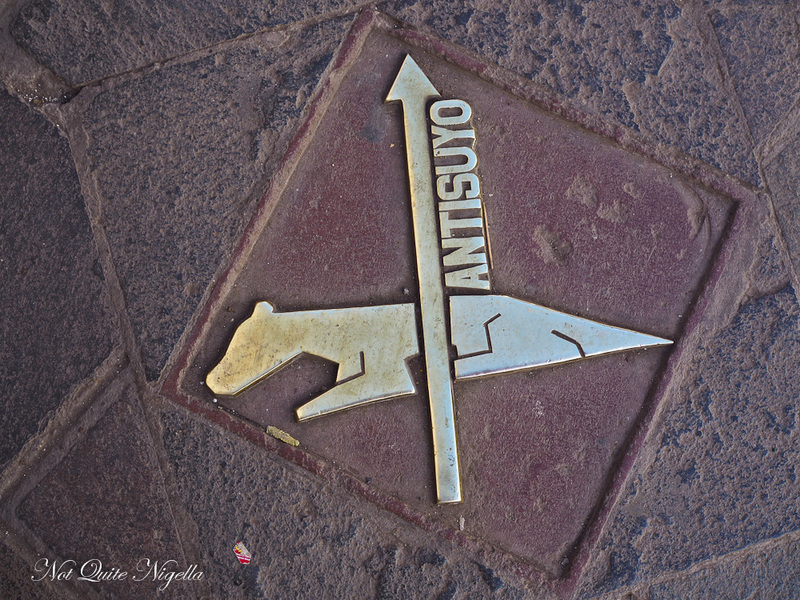 600,000 people live in Cusco and yet it is a bustling town with 2 million visitors a year. Some come for the architecture, some to see Machu Picchu the incredible Incan city for themselves. Others come for spiritual reasons or to explore the Amazonian medicine or just to see the capital of the Incan empire. The present day's building have a mix of Incan and Colonial architecture from the Spanish invasion in the 1500's. One of the most stunning and well preserved examples of Incan architecture is at Korikancha, the Incan word for Golden Temple or as the Spanish called it El Dorado for it was covered in gold when they first saw it. Built in the 1400's it is one of the most popular stops as it one of the best examples of the craftsmanship of the Incan stone work. 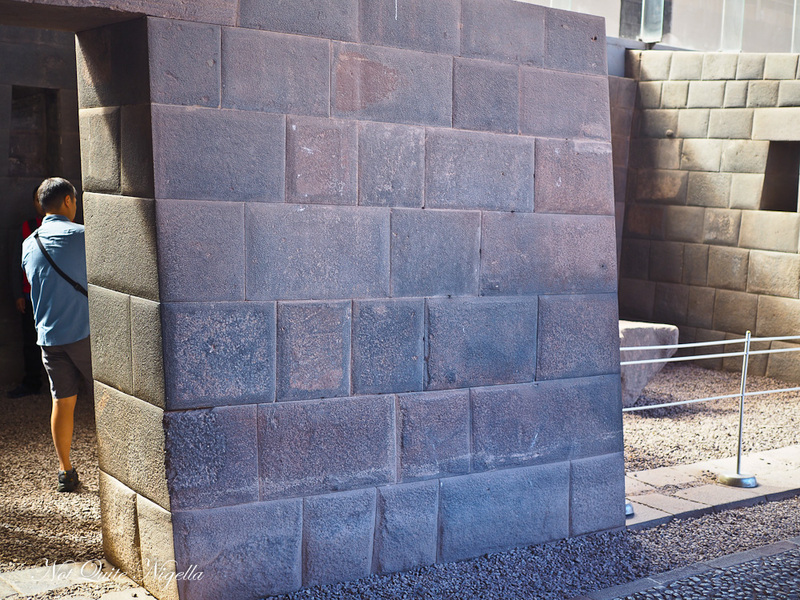 Incan stone work involved no mortar, simply the interlocking of stones to keep them secure. The Incans also discovered the strongest shape was the 5 sided trapezoidal shape and the Korikancha has survived earthquakes with the walls intact. I visit the Temple of Stars where there are 25 niches carved in the stones and it used to have 25 constellations represented in gold. This was the most important ceremonial place in Incan empire with high doorways to bring Incan kings in to be crowned. 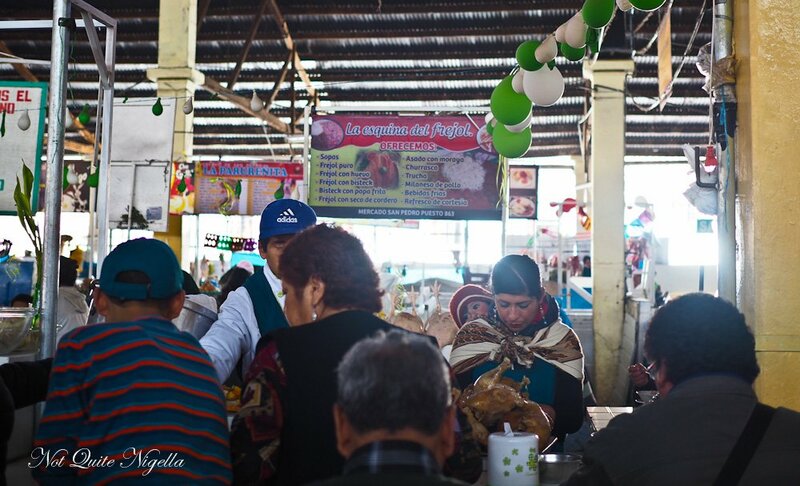 I then head to San Pedro market to warm up with a bowl of chicken soup or caldo de gallina which is a hen soup. Even a stop mid morning garners plenty of eating opportunities as locals eat their brunch around 10:30am. You can get breads, sweets and cakes as well as sandwiches, salads and fresh juices. But my choice is chicken soup given the chilly weather in Cusco. 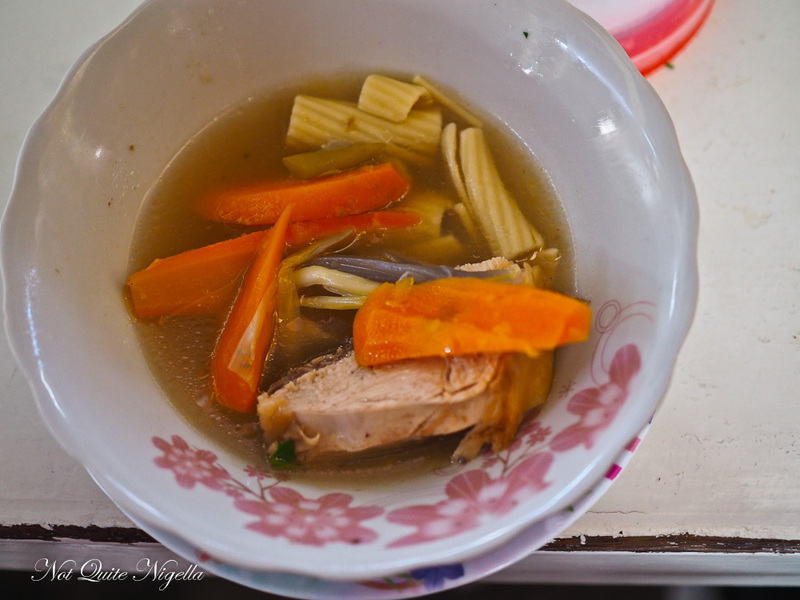 You choose the cut of chicken that you want and they'll serve this rich broth with vegetables. It's up to you if you want a squeeze of lime in your broth but no doubt you'll end up slurping up all of the goodness of the soup-locals believe that it gives you energy and has restorative powers. My guide then shows me the various types of flours and salts on display. Pink salt from Maras is a steal and makes for great souvenirs. And then my guide shows me the dried potato. They dry potatoes to make them last longer. They are dried at a high altitude of over 4,000 metres on grass. At night the temperature reaches -10°C so the potatoes freeze. After 3 weeks they squeeze the potatoes and and then continue the drying process for another 3-4 weeks. To use them again you rehydrate them overnight. 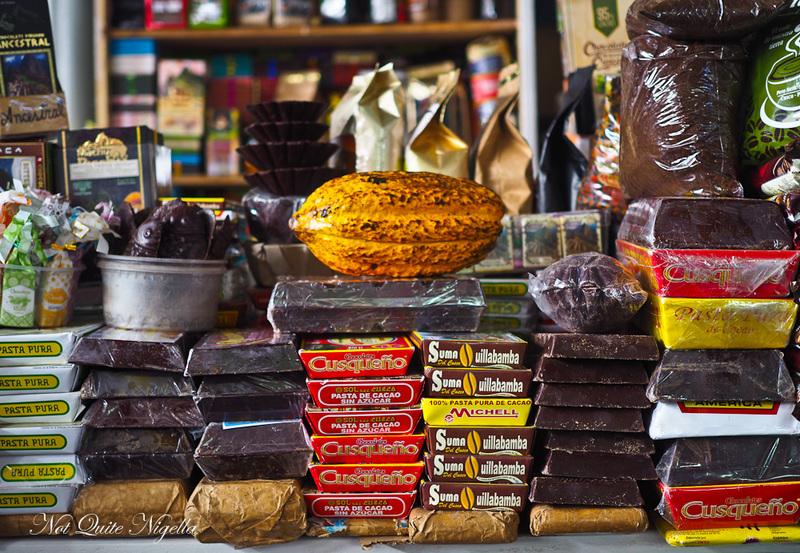 San Pedro market also has a small but aromatic section devoted to what else but chocolate. You just have to appreciate a market that has its priorities so right. There are two types of chocolate: eating chocolate i.e. chocolate with sugar as well as cooking chocolate which is not like cooking chocolate in Australia (which is usually lower quality chocolate but just as sweet as eating chocolate). 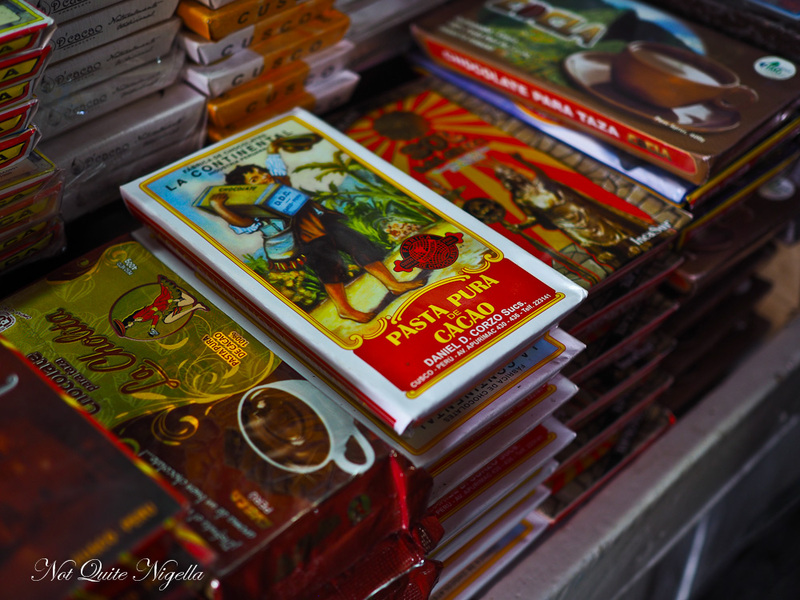 Cooking chocolate aka "pasta pura" does not have any sugar at all and is 100% cacao. I sample a variety of different types of chocolate from the bitter pure cooking chocolate to chocolates with various cacao strengths. I love the 80% chocolate and buy a bar for 15 soles or around $7AUD. 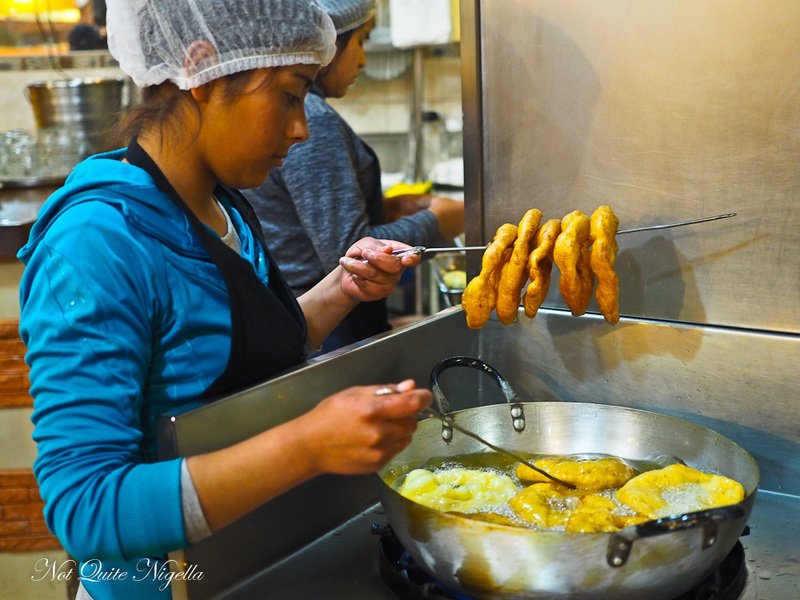 My next stop is a foodies stop about an hour away to visit two towns known throughout Cusco and Peru for their respective foods: Oropesa or "Bread Town" and Saylla or "Chicharrones town". To get there we drive south past quinoa plantations as well as an Ancient Incan village from 1,300 years called called Silkinchane. On the left there's a Spanish colonial house gone to ruin with oxen grazing outside. I reach Orepesa where the main town's industry is baking Pan Chuta. These enormous loaves can measure up to 30cms in diameter. They are taking loaves out of the oven as I arrive. They offer me a loaf and I tear off a piece. It's wonderful and unexpectedly sweet. 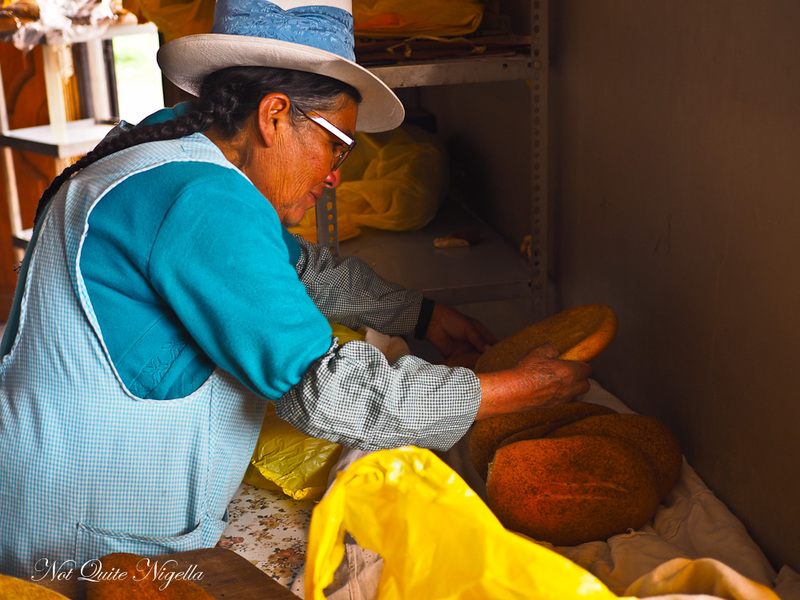 Pan Chuta bread started here around 400 years ago when the Spanish introduced wheat to Peru and Gleni, the baker's daughter explains that they still use the traditional recipe. 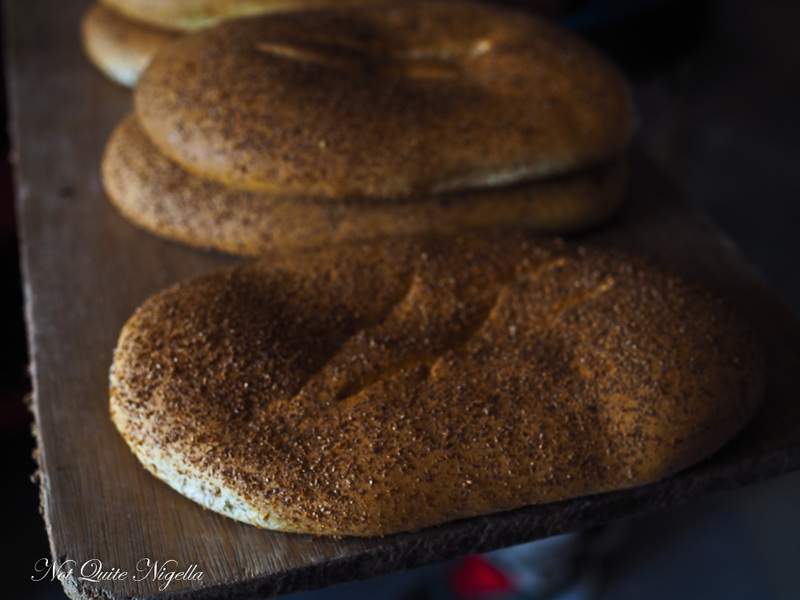 It is said that when they try and make Pan Chuta elsewhere it doesn't taste the same. They use a wholewheat flour although on occasions they can also use kiwicha or quinoa flour. The bread contains special wholewheat flour, water, eggs, butter, spices and brown sugar and a little yeast. One large round is 5 soles (around $1.50AUD) while smaller ones are 1 soles (around 40c). Each loaf can be kept up to 2 weeks. 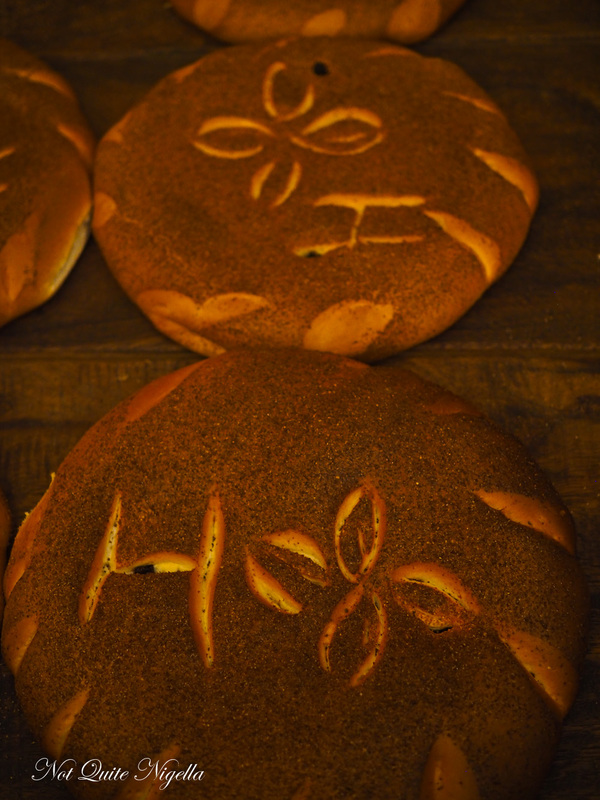 Between 10pm-2am the dough is made and the bread shaped with the distinctive harvest/wheat patterns and then sprinkled with wheat germ. Then it is baked from 2am-4am in a wood fired oven using eucalyptus leaves. 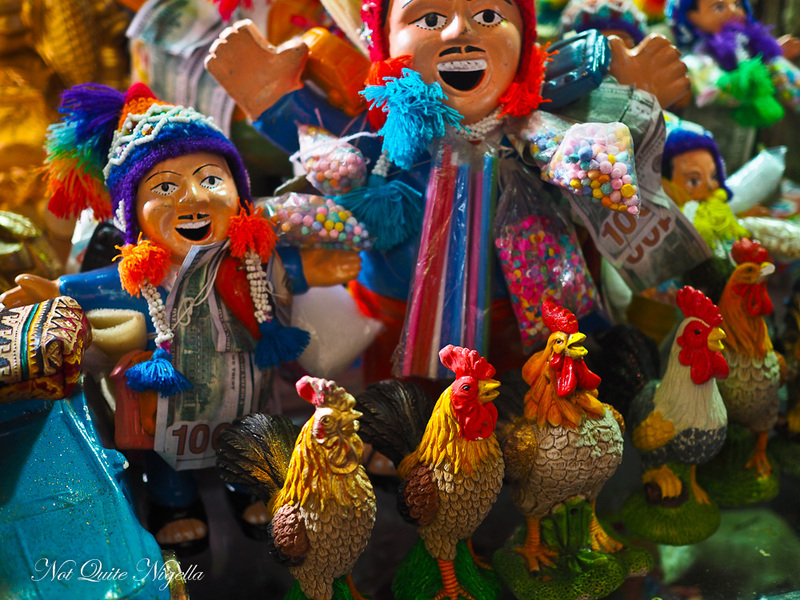 It is then sold all across Cusco at markets. Each day they bake 2,000 loaves and they are so well loved that they are brought as gifts. It's lunchtime! We head back towards Cusco past a small village where once a month an Indian priest diagnoses people's ills via black guinea pig. Indian is the word they use for the native Quechua people as Quechua is the language. They pass the guinea pig around the person and then cut it open to reveal what ails the person. 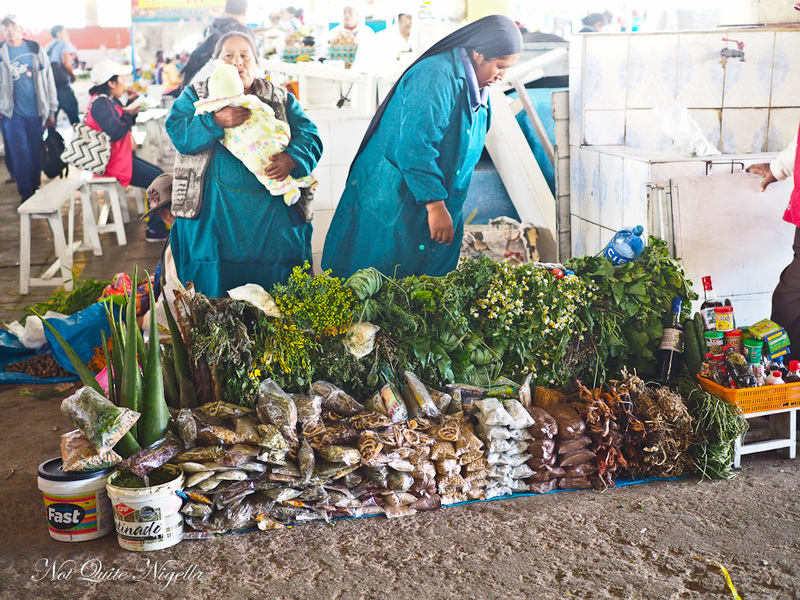 It is popular with some South American clientele and the priest does a busy trade. I stop at Saylla a town known for its chicharrones pork. Chicharrones are a country style pork rib cut into pieces. First it is boiled and then it is deep fried in its own fat and it is usually served with fried potatoes. Lunch is at a 10 year old chicharronera where I also try various types of potatoes. 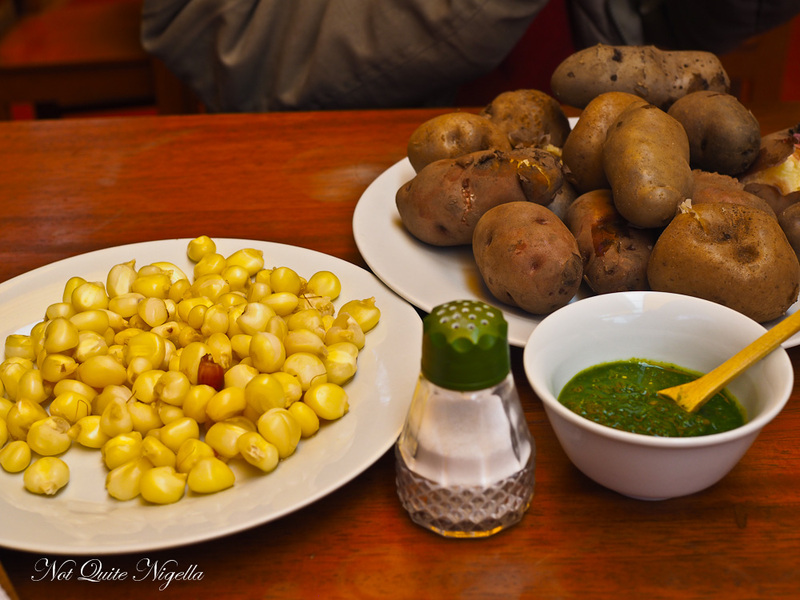 There are four types including Maqtillo, Huayro and Cica potatoes with Uchucuta sauce made with garlic oregano coriander oil. I snack on boiled corn which is made of dried corn that has been soaked overnight and boiled for 1.5 hours. The kernels are huge and it isn't a particularly sweet corn. 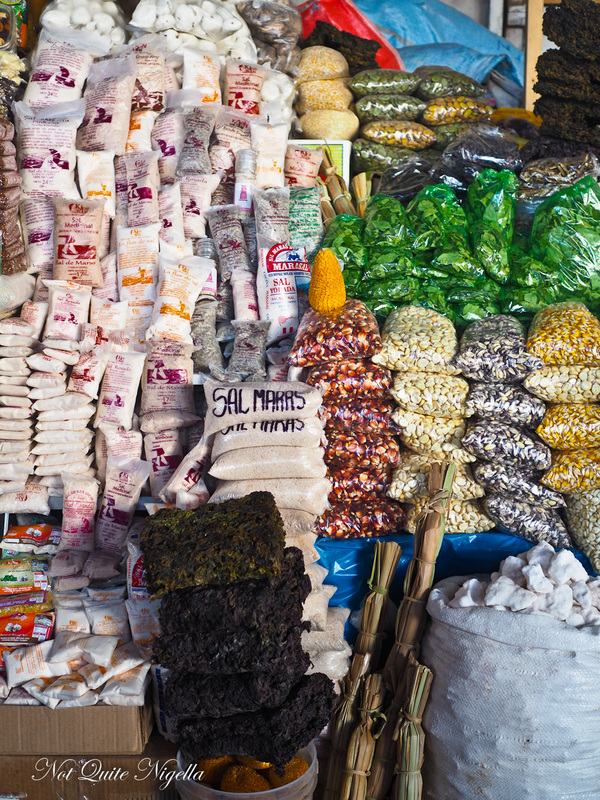 Corn and potatoes made up the Andean diet and even today farmers pack this for their lunch. Following this is a plate of pork crackling with tiny delicious bits of fried pork fat and dried corn. And then comes a plate of freshly cooked chicharrones. It is served with thin fried potato slices, boiled corn and a salad of mint and red onion. It's delicious and the herb salad lightens the food and I eat this the traditional way-with hands. 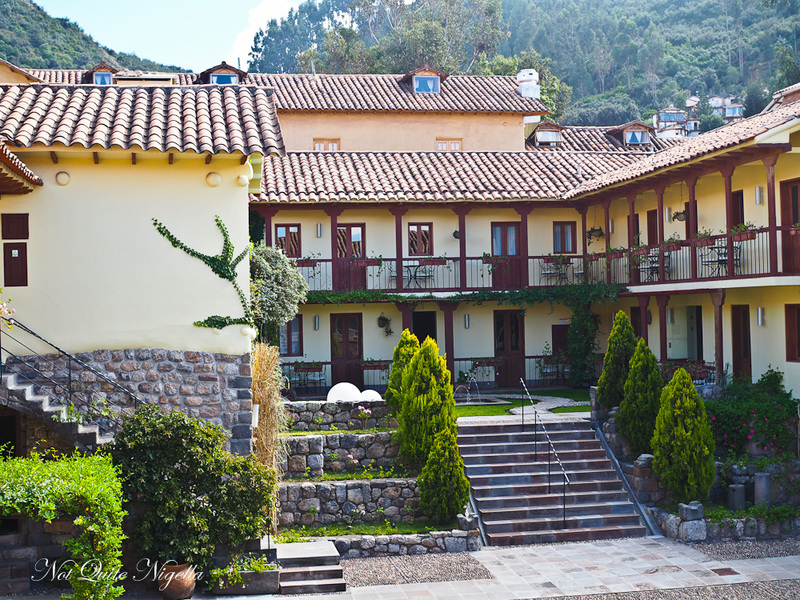 My hotel in Cusco is the Casa Cartegena, a stunning 5 star boutique hotel. 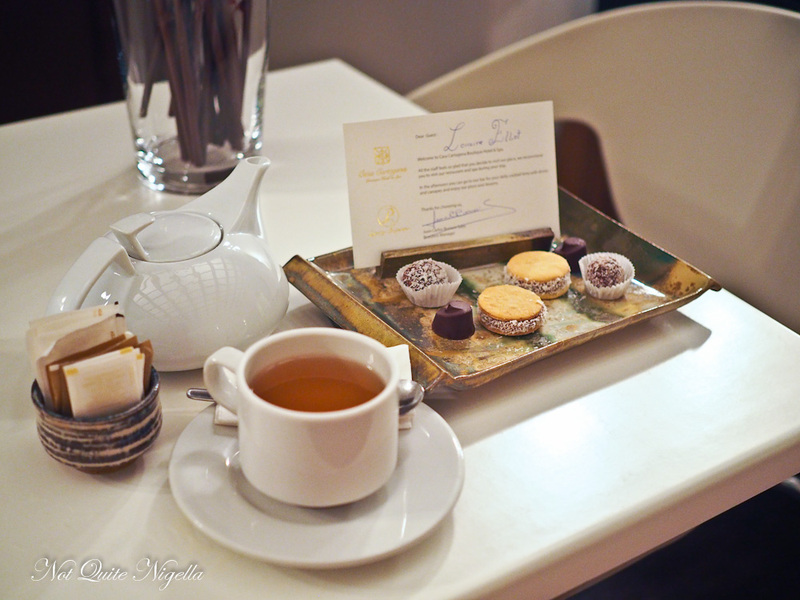 Service is deferential and I am led to my suite. There is an enormous bedroom with comfortable twin beds. 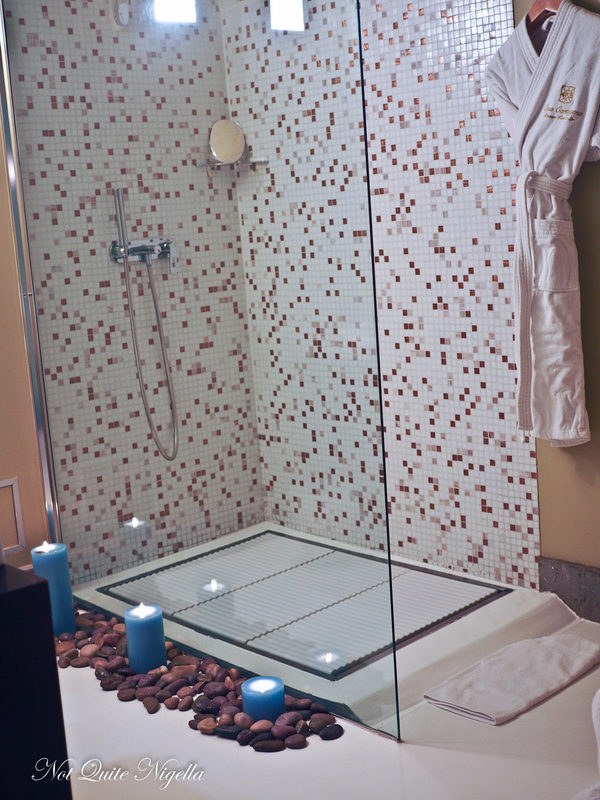 The bathroom is also massive with a separate tub and shower as well as fantastic toiletries. Behind a curtain there are double wooden doors that open to a Juliet balcony with a beautiful courtyard and a view directly to the white Jesus statue on the hills above! There are alfajores and chocolate truffles waiting and before long there's a knock on my door. They've brought some Andean mint tea, a digestive said to be good to adjust to altitude. I have suffered a lot with altitude on the first day but today at the end of the second day I feel much better. 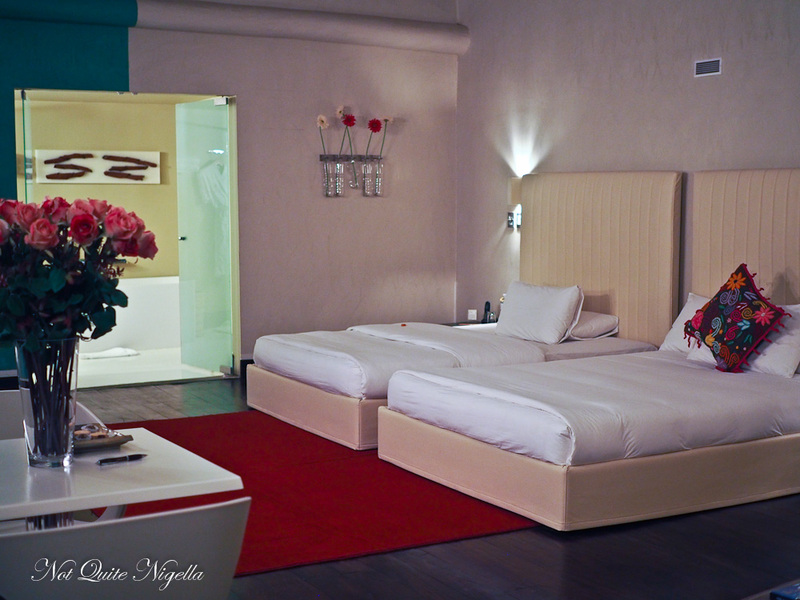 The hotel also has the Enriched Oxygen System with two methods to raising oxygen levels in the room. The first is a dosifier above the bed so that you sleep better and the second is clinical oxygen dosifier to use through a breathing mask. Someone arrives to run my bath for me with special Peruvian salts to relax muscles. It's a most welcome complimentary service for those that have just come from Machu Picchu bringing with them sore limbs in need of massage as well as great tales of spectacular beauty. 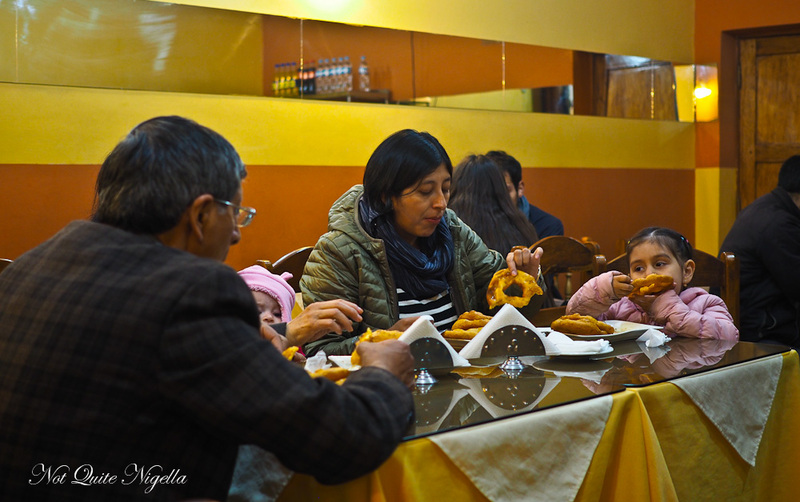 In Cusco the slow digestion from the high altitude means that people often have small dinners so picarones and skewers are often eaten for dinner. My guide takes me on a little street food tour of Cusco before dinner. 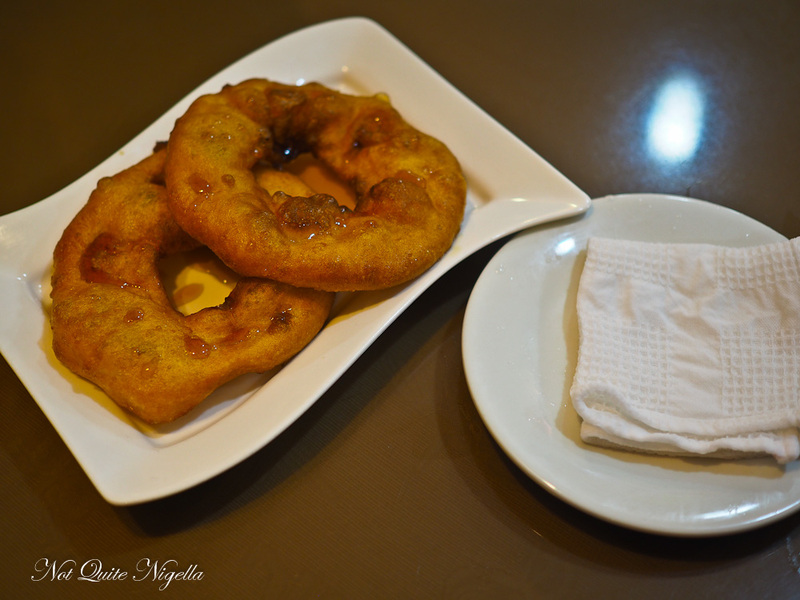 The first stop is for picarones, large puffy sweet potato and pumpkin donuts. They're a steal at 5 soles for 5 donuts and I see a family with a plate of 5 per person, the baby learning to navigate the sticky donuts covered with honey. First wet your fingers with the wet cloth, dry it with a napkin and eat with fingers. They're puffy and delicious and not overly sweet too. 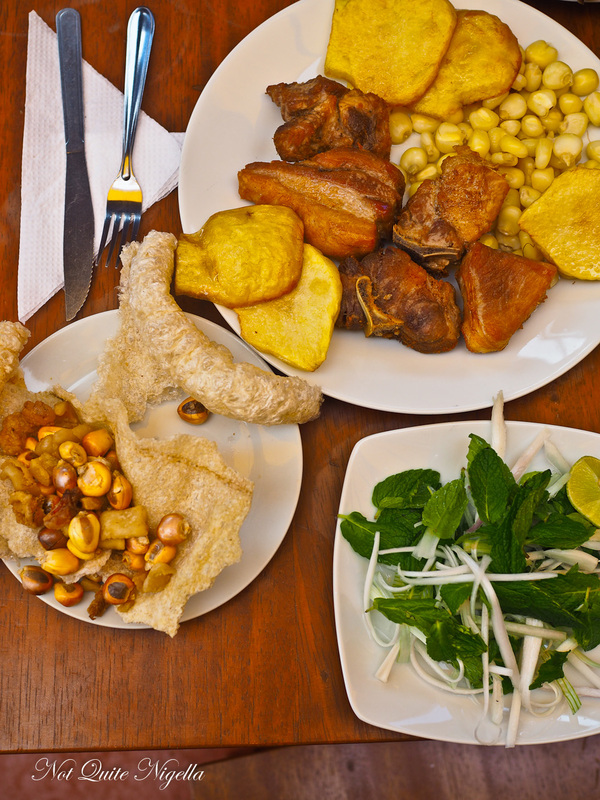 Our next stop is one of the foods that Peru is really known for but hasn't really made it across to other countries in the same way that ceviche or Pisco has. "I have guinea pig about twice a month," my guide says. He estimates about 50% of people in Cusco (and 100% of the indigenous Indians in Cusco) keep guinea pigs in their home. He has 62 guinea pigs and they eat them to control the numbers as they breed quickly. The guinea pigs eat mainly barley and vegetable scraps and are kept in a cage. At the age of 4-5 months old when they are large they are despatched or they are also prepared for special occasions. 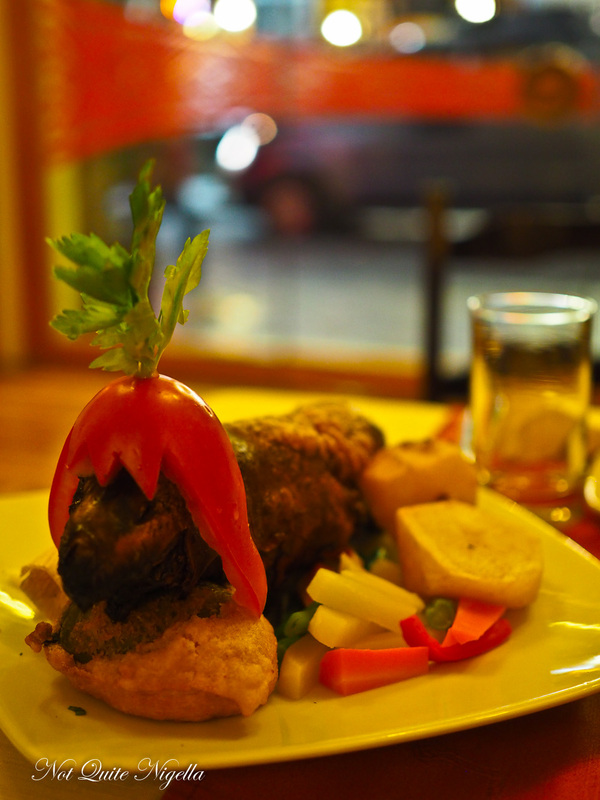 Guinea pig is prepared differently in Cusco than it is in Arequipa where it is fried in oil. To prepare guinea pig Cusco style, they cut them down the centre and remove the innards. Then they boil them to get rid of the fur. They marinate the guinea pig overnight with a Amazonian herb mix called Ukumari. The final step in the preparation is roasting at the local bakery's oven. Each guinea pig costs 10 soles or $4AUD to cook. At Don Thomas they know that people like to take photos so they bring each table a stunt guinea pig for photos which they pass around. My half guinea pig is 35 soles or 70 for a whole guinea pig. With the aji chilli sauce or the fresh onion and tomato salsa the guinea pig is absolutely delicious, like a very crispy roast chicken or duck but with less meat. I head to our last street food stop before dinner. 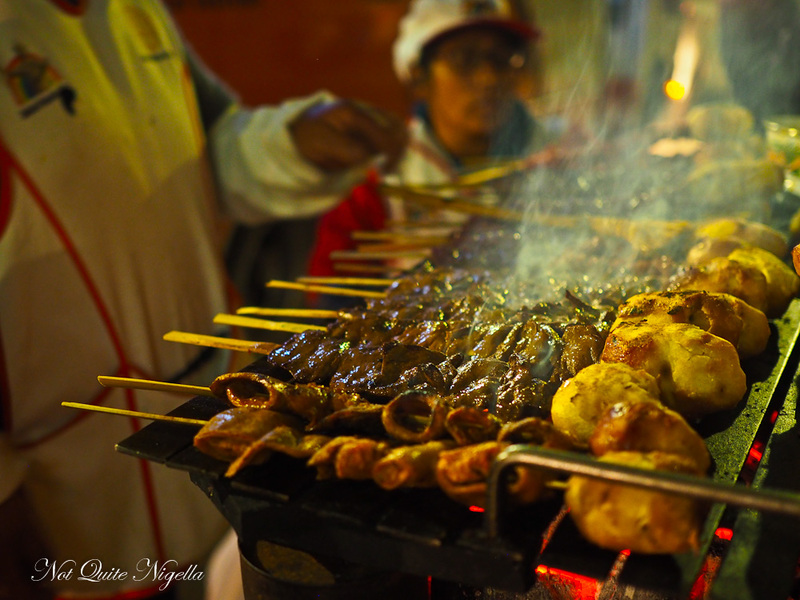 Every night from 6-10pm the Anticuchos sellers come out. Anticuchos is the name for long wooden sticks with offal with a whole boiled potato at one end. Rinones are kidneys and corazon are beef heart. We try an anticuchos de corazon and it is absolutely delicious and tender. 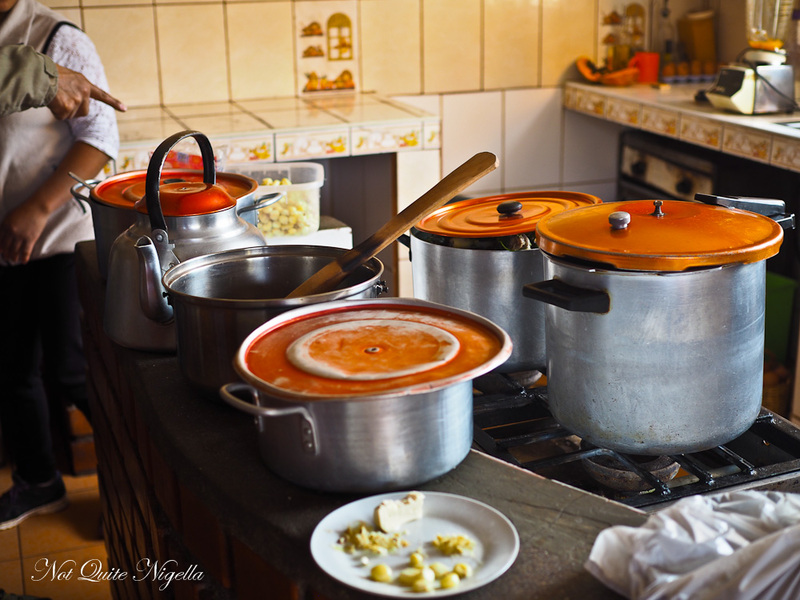 Look for the seller at the intersection of Maruri and Moreto streets and order and feast on the food and the scenery unlike no other. So tell me Dear Reader, have you ever been at a high altitude? And would you travel an hour to visit a historical bread town? All meals in this post were independently paid for.